After more than a year, Mighty Crown "The Far East Rulers" and Irish and Chin will embark on a World Tour starting in October 2009 to celebrate another major career milestone, a third Nike sneaker deal. The Irish and Chin produced tour, dubbed "'The Mighty Crown Dynasty World Tour," after the soon-to-be released sneaker, will feature three of Mighty Crown's five members: Masta Simon, Sami T and Ninja. The Crown Dynasty Tour will represent the first time that Sami T and Masta Simon have toured together in over three years. 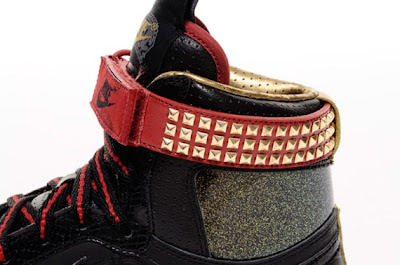 The shoe, dubbed Nike Dynasty Hi, features a translucent outsole, black crackle print on the midsole, a diamond studded ankle collar, and a crown logo on the extended tongue. Mighty Crown’s “Crown” logo is imprinted on the Dynasty’s middle panel. The red strap nicely counterbalances the dominance of black in the shoe. 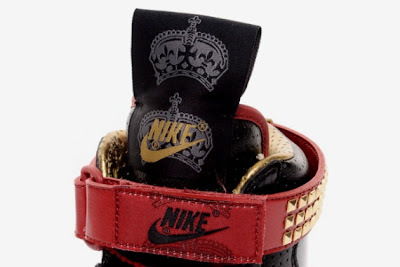 The Mighty Crown and Nike Sportswear Dynasty High Premium will release later this year in limited quantities. Each of Crown's members has been pursuing successful endeavours recently, which has prevented them from touring together. However the Mighty Crown team is now set to deliver much over due dancehall entertainment to their fans. Mighty Crown is arguably the most successful non-Jamaican dancehall sound system worldwide, proving their worth both as a clash jugglin' sound. At this time, Mighty Crown is armed, dangerous and ready for war. The Crown Dynasty Tour will consist of both juggling and clash dates, something the sound took a break from. While Simon, Sami T and Ninja tour, members Supa Gee and Coji will continue locking down Japan. "We took a break so that Sami T, Chin and I could take on other business ventures," says Masta Simon enthusiastically. "Now that we have gained individual strengths, it's time to bring our power together to focus on elevating Mighty Crown to another level." Mighty Crown is eyeing 20 plus dates for the tour and can't wait to get back to the arena. Mighty Crown is ready to add this high profile tour to their growing list of accomplishments. A strong business sense has made Mighty Crown the definition of dancehall in Japan. Notably, the sound has been afforded with three sneaker deals to date, a leading Japanese record label, two clothing lines and a magazine. And finally, an annual stadium show that draws over 30,000 patrons. just to add to my previous comments, ugly or not, it's not going to stop the nyguhs in this country from wearing them.